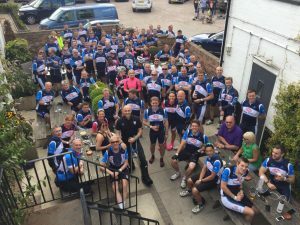 I am delighted to report another amazing cycling event for TEAMITFC. This is year four of our fundraising events on the bikes and the Tour of Suffolk was our biggest ever. Just under 100 cyclists took part and I am glad to say all of them returned to Portman Rd safe and sound. We took on the whole organisation of the ride and had a magnificent support team of 12 volunteers and 5 donated vehicles. The support team saved us thousands of pounds which means all the money raised by each cyclist goes directly to the nominated charities. Our Sponsors and partners also contributed to making this another brilliant event and we thanks them all very much for their continued support. 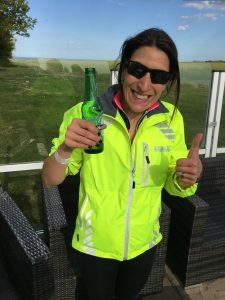 You will see some blogs below from cyclists who were prepared to share their story of how the ride went and what they personally got out of it. Every cyclist who signed up and took on the challenge will have their own personal reason for doing so. Here are a few examples of their time on and off the bike. Along with some very happy emails they make very good reading………………….. I have been (let me use the right words here…) encouraged and inspired to participate in the Tour of Suffolk Cycle Ride with Team ITFC…! And Ipswich Central have asked that I write a blog of which I have pleasure in doing. 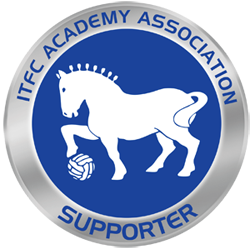 I shall be cycling over two days, 150 miles, raising money for PCUK along with donating funds to the ITFC Academy. You can read how I came to be involved in what I know will be a remarkable event where I and nearly 100 other cyclists are taking part. Healthy living and sport is so important and Ipswich as a town along with Suffolk as a county is prevalent in hosting many sporting events from running to cycle rides. My role at Ipswich Town Football Club allows me to focus on promoting the importance of sport, namely football but also the sporting events we are involved in, across the region commercially. Those of you who know me will know how much I love a good challenge – and my passion for shoes! In late October 2016 my husband bought me an early birthday present – a matt black CUBE road bike. I obviously then went out to buy the shoes to match (see attached pic!). 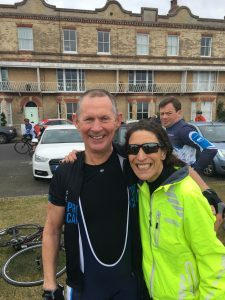 I had ridden the bike three times, once with my clip-in shoes, before I bragged to my colleagues and to Simon Milton and before I knew it, I was signed up to ride 150 miles over 2 days! Since being cajoled into taking part, I have cycled a bit more to help prepare me for what lies ahead! Much organisation, time and support has and will contribute to the next two days. This initiative is being led by my colleague Simon Milton who is unable to take part due to sustaining a recent sports injury! He will lead the support team and be en route via one of the support vehicles. Day one: ITFC, East of England Co-op Eye, Black Swan Homersfield, Swan Hotel Lodden, Potters Resort in Great Yarmouth. Day two: departure from Potters to Southwold Pier, White Lion Hotel in Aldeburgh, Ship Inn Blaxhall, East of England Co-op Woodbridge, The Greyhound arriving at the ITFC finish line! Thank you for taking the time to read my blog, I will be posting updates over the next two days at various points! Thanks also for visiting my fundraising page and for your support. I’m off to eat some pasta as I am cycling early tomorrow! Having arrived at ITFC at 7.55am, I made my way to the registration desk whilst my husband (such a magnificent support and quite literally my aid) placed my bike amongst the other bikes in my group. The instructions were provided to all the cyclists at the Team ITFC briefing which took place the Thursday prior at the Dove. We had all obviously paid attention as we all followed the instruction which was given. We were fed in the Fanzone Marquee prior to setting off and my group – Group 1 were due to be the first to set off. There were 5 cycling groups in total each with 4 team leaders. Our start time was 9.15am – however, the heavens decided to open and for some time, it rained and it was agreed that the start would be delayed. We set off 20/30 minutes later which made all the difference as it was dry and quite frankly, I was relieved as I had never ridden my road bike in the rain! I didn’t want to contend with the rain, knowing that I really needed to focus on the clip-in shoe situation (please bear in mind I am still a novice in relation to these shoes – well, I was!) and also the amount of miles I was about to cycle over two days (total training miles accumulated prior to the Team ITFC Challenge 61 – over three separate rides from March to April 2017!). We made our way from the Club to the St Matthews Street roundabout and then up Berners Street – a nice gentle hill to begin with. We continued through to Westerfield and then onto our first stop in Eye. It turned out to be a wonderful day weather wise. The sun was shining and the route we took was quite beautiful. We were able to take in scenic Suffolk! The main leader in my group was John Reader from GAH – John was the main sponsor of the event. He led the team by example. Offering support and guidance where needed. And motivational music too – a mixture of Bollywood and Hip Hop! The refreshments provided by the sponsors were fantastic and the miles between each stop were perfectly timed. Lunch consisted of a pasta dish in gorgeous sunshine! Our last stop before reaching our final destination of day 1 was Lodden – approximately 12 miles from Hopton. My group decided to stay in the sunshine for a while and chat through the events of the day prior to making our way to Potters. The last 12 miles breezed by and before I knew it 73 or so miles were done! Completed! Big Tick! And when I crossed the finish line on day 1, a cool beer was planted in my hand which was certainly enjoyed! Day 1 saw some of the groups separate which was understandable as there were cyclists of different standards. Group 1 remained as 1 however. The hospitality at Potters was fantastic a sumptuous meal which was needed after such sporting activity! I headed off to bed, hoping for a good solid night’s sleep – it wasn’t to be, all I could think about was bicycles and roads! I am sure at some point I eventually nodded off but before I knew it, it was morning and we needed to prepare for the day ahead. Off to breakfast we went – each cyclist was given a PCUK cycling shirt for participating in the challenge which we all wore with pride on Day 2. And so, my group were the first to set off. It wasn’t raining when we began and so promptly at 9.15am we set off. As we left Potters we were heading to Lowestoft and it was decided that each group would separate in to two further groups to deal with the busy road situation. I can honestly say, the first 20 miles were tough! Extremely tough, it was raining, it was chilly and it was windy. Arriving at Southwold Pier was a welcome stop! We refuelled and then set off again to Aldeburgh. Although I thought the first 20 miles on day 2 were tough, the ride to Aldeburgh was dare I say it tougher – at this point, I have to say I was cursing Simon Milton who ‘made’ me take part in the cycle ride! The coast road was long, there was no shelter and it was windy!!! Our next stop was Blaxill for lunch, by this time, group 1 had disbanded a little – and I had begun cycling with Steve Curzon. We met the other group 1 cyclists at the next stop and having spoken with my group, Steve and I had eaten and decided we would set off and see the rest of the group at the end…at this stage, we just wanted to get back to Portman Road and we knew from Blaxill, we had to cycle the long way round to Woodbridge which consisted of 18 miles! The objective of this was to avoid the main roads of course and to ensure we clocked up the miles to reach the 150 total distance. So off we went. The wind was horrendous and making our way down some hills was a struggle as the wind was pushing us back – instead of hitting speeds of 21 or 22mph – we were reaching only 15 or 16 mph because the wind was having an impact. As we came through Westerfield, the memories of the day before and the feeling of apprehension re-visited my mind and I thought to myself, how far I had come in terms of confidence on a road bike on busy roads with clip in shoes! Back down Berners Street, it was busy traffic wise as it was around 4.30pm…Portman Road was in the near distance and I couldn’t wait to cross that finish line…as we approached, we had grouped with some other cyclists and as they knew I worked for the Club they encouraged me to cycle through the finish line before them which was touching! 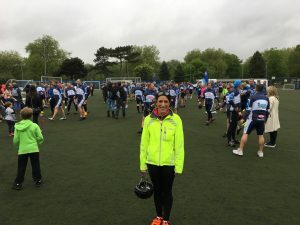 There was a welcome party at Portman Road consisting of ITFC staff members, friends and family of all the cyclists – they were cheering as every cyclist crossed the finish line! It was magnificent! I whoop-whooped as I crossed the line and cycled straight to my husband who was there waiting for my return! I was the first female to cross the ITFC finish line and I was extremely proud! I cannot express how unbelievable the Team ITFC Cycle Challenge was. The amount of effort and focus by Simon Milton, John Reader, the support teams and the sponsors was outstanding. Although apprehensive beforehand, I was absolutely delighted and privileged to be involved. I knew many of those who took part but I also met some new people and struck up new friendships. I must mention at this point my good friend Clive Hammond who travelled from Hong Kong especially to take part! Shaun Whiter who also took part was an admirable inspiration. Having only got his hand-bike in March, he showed strength and determination as did all the cyclists. Thank you sincerely for reading my blog and for sponsoring me. Funds have been raised for such great causes and I appreciate your support as do the charities.